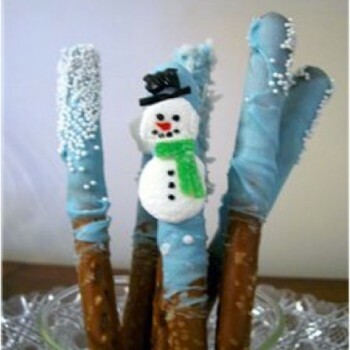 Dip some Snyder’s of Hanover® Pretzel Rods into melted blue candy melts. While the chocolate is still warm, roll them in white candy sprinkles and set aside. While waiting for the chocolate on the rods to cool and harden, slice some marshmallows, trimming half of the slices into smaller circles with scissors. Simply press the sticky side of the marshmallow slices on the rods and using food coloring painted on the eyes, nose, mouth and buttons. The hat is made with a small black gum drop and the scarf is made with two thin slices of a candy spearmint leaf.